This PTFE Freezer Mat/Sheet/Liner is not only a convenient product, but also a very important cooking device that promotes healthier eating. It reduces calories because the mat enables you to cook without adding other fat or grease. 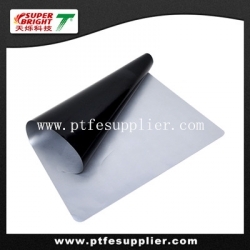 It surpass the qualities of baking paper and aluminum foil combined with the advantages of . No need for grease or flouring, the liners are 100% non-stick and prevent anything from sticking to or burning on the liner. Non-stick cooking: cut to size and place in the bottom and around the baking tin to bake pastries, biscuits, pie, fruit cakes, etc. or place on the bottom of your baking tray to bake meringues, flapjacks, pizza or oven chips, etc. Anti-burn roasting & grilling: place in the bottom of the roasting tin or grill plate to prepare meat, fish, poultry, etc. The PTFE Freezer Mat/Sheet/Liner provide an ideal solution for many medical problems, such as obesity, diabetes and cardiac disease. Calories are reduced by up to 80% because the liner enables you to bake without adding any other fat or grease.